The town of Gien underwent severe bombing in 1940 and in 1944 resulting in almost total devastation. Post-war reconstruction work relied greatly on local building materials : freestone and glazed pink bricks (2-tone brick). The church of Sainte Jeanne d’Arc, built in the 20th century, is a reference piece for sacred art. It was rebuilt between 1950 and 1954 using local brick (with the inside built to form a semicircular brick vault), only the bell tower remains from the 15th-century St Etienne collegiate church. The “Rue des Degrès” shows how different the street levels are between the château and the lower town. The old bridge consists of 12 arches of different heights, the highest, which are close to the hump-back, were used for navigation.Saint Louis had it built in stone in 1246. In the 15th century, construction work consolidated the 12th-century bridge which itself had originally been built on the foundations of a medieval bridge. In the garden “les Boulards”, close to the narrow street along the old city wall (ruins of the old wall), can be seen the arches of the “Hôtel Dieu”. Discovered after bombing in 1940, these arches date from the 12th or 13th centuries. 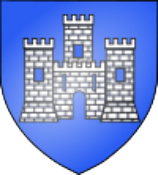 Dominating the town and the Loire, built on the site of a medieval castle (9th century), “château of Gien” in 1199 belonged to the Crown and therefore has its place in the history of France (“Jeanne la Pucelle” (Joan the Maid of Orléans) stayed here in 1429). In 1484, Anne de Beaujeu, the oldest daughter of Louis XI, had this building reconstructed on the foundations of the old château of which only the square tower remains (the only white part of this red-brick construction). Since 1952, the castel has housed the International Hunting Museum : “Chateau de Gien, chasse, histoire et nature en Val de Loire”. The city houses the Museum of the Faïencerie and his factory store. Origin of the town’s nam : "arabla, maple, place which products maple". The village became associated with Gien in 1972. Behind the church there is a feudal castle. It shows the military construction of Philippe IV’s period (1285). This vestige can be seen only from the outside. This fortresse is surrounded with a large ditch. Four octagonal towersdefended its four angles. To enter inside the castle, there was a dawbridge. In the east, a round keep dominated all the constructions. Famous person : Jean d’Arabloy, friend and confident of Philippe IV. Monday to Friday from 9 am to 12 am and 13:30 pm to 5:30 pm (except Friday until 4:30 pm) and Saturday from 8 am to 11 : 45 am. Wednesday from 2 pm to 7 pm and Saturday from 9 am to 12 am.